Invasive pests, changing climate regimes and increased urban density will cause changes in our urban forests in the coming years. What tools and strategies can managers use today to help our community forests adapt? This one-day conference provided participants with a toolkit full of possibilities, based on the most recent research in our field. The answer is: Add organic matter! Organic matter and clay have a negative charge allowing for minerals (nutrients) that have a positive charge to attach to them. 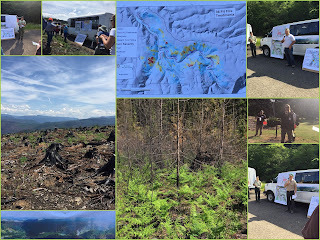 This field trip focused on learning about the behavior of the 36-Pit fire as told by those who experienced it, including details on fuel conditions, topography, weather, and the suppression effort. Discuss management implications with respect to fire resistance, fire resiliency, and fire safety. Last September an unprecedented forest fire burned on Oregon's NW side, Pit 36 Fire. 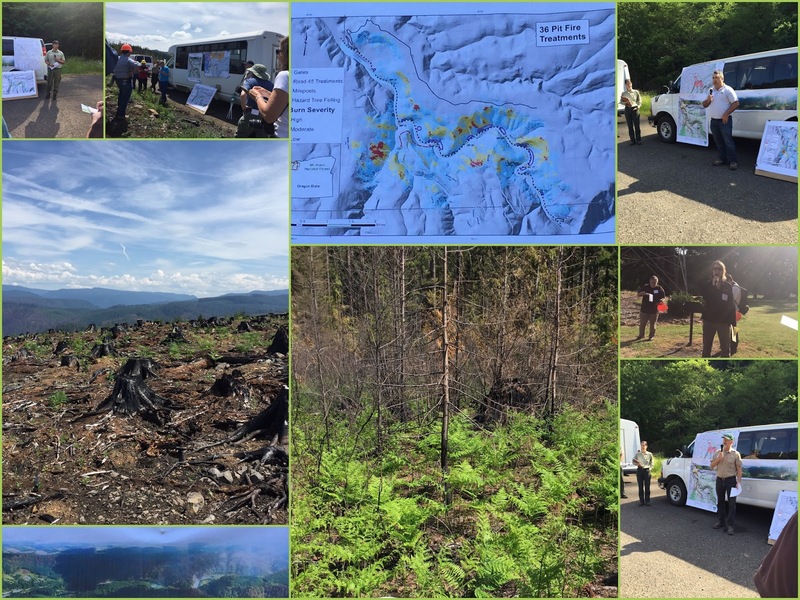 Over 5,500 acres of forest on Federal and private land burned down over 9 days. Low relative humidity, high temperatures, high East winds, and steep topography created the perfect conditions for a forest fire of large magnitude to spread fast. Usually wind conditions slow down during night hours, but in this case they did not, allowing for the fire to grow overnight. The fire was human caused by a target shooting spark. Forest fires are monitored with satellite imaging to declared them out, and this one has not been declared out yet, waiting upon a satellite image coming in the fall. 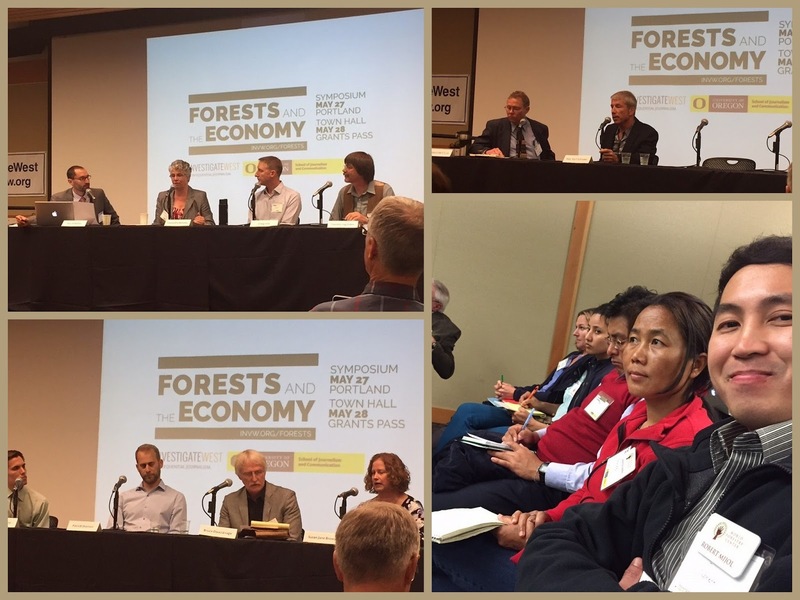 The Portland symposium featured leading experts that discussed innovative ideas and policy proposals for managing Oregon's forests. Sustainable forestry was defined as mimicking natural processes to attain long term forest health, managed for multiple values to meet human needs without degrading the resource. Issue: Of the 4.3 million acres of family forestland is 1.9 is inside or within 1 mile of an urban growth boundary. Q. How to compensate private owners to avoid having to change land use? A. Aggregate small forestland owners to compensate them as a group. Embrace a landscape view to manage the forest with a shared vision. Hyla Woods is a 1,000 acres forest land on the Oregon Coast that manages its land under FSC principles. FSC certification is not helping to provide premium prices for their products. Issue: Not enough mill capacity in rural areas. Forests could be managed under restoration practices, providing small diameter logs (<10") from thinning to mills. There should be tax incentives for this mills to open. Issue: Timber prices fluctuate a lot. How do you manage for the long term? Forests can be managed in multi treatment lots allowing for a diversification of products at extraction. Markets for small woods is starting to develop (i.e. Cross Laminated Timber CLT).